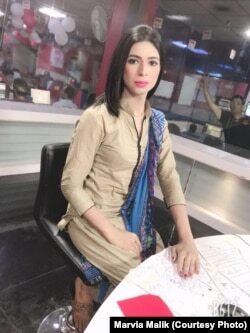 Pakistan's first transgender newscaster, Marvia Malik: "I have become a ray of hope for the community." When Marvia Malik made her debut as a news anchor for the private broadcaster Kohenoor TV on March 23, it was more than a first for her -- it was a first for an entire community. Members of Pakistan's "third gender" community -- which can include transsexuals, transvestites, eunuchs, and hermaphrodites -- are often shunned, pushed to the fringes of a conservative society. But even as the community has made notable advances -- for example, "third gender" was granted official status in 2011, earning members the right to vote, and earlier this month a bill was passed in the Senate protecting people's right to determine their own gender identity -- Malik debuting as the country's first transgender news anchor can be seen as a leap forward. It has been a long journey for Malik, a 21-year-old transgender woman who has gone from makeup artist to catwalk model to the face of her community. Malik, who was moved to tears when she landed her new job, is clearly proud of her achievement. "I have become a ray of hope for the community," Malik said in a telephone interview with RFE/RL’s Radio Mashaal from the city of Lahore. “They believe the day when we will be considered normal citizens is closer." But she concedes that there is a long way to go before transgender people shed their second-class status in the South Asian country. Her goal now is to serve as an example of what is possible. "If I can reach these heights without my family, the government, or anybody else," she said, "then any transgender can, too, if they are treated as an ordinary citizen." Marvia Malik says her goal now is to serve as an example of what is possible. Born and raised in the city of Lahore, Malik struggled for acceptance at an early age. She says her family members beat her and forced her to act and dress as a boy. When she refused, the family disowned her when she was 16 years old. "There is no difference in my story and that of the other 'khawaja sara,'" she says, using an Urdu word that encompasses transvestites, transsexuals, transgenders, and others who could be categorized as "third gender." Many members of the community describe themselves as "professional wedding dancers," although supporters say many are forced to earn income through prostitution or begging. Often dressed in bright-colored saris -- a traditional dress worn by women on the subcontinent -- and wearing heavy makeup, some roam the streets asking people for money, making them targets for extortion, sexual violence, and criminal gangs. They have a reputation for showing up uninvited at major family gatherings such as weddings and birthdays, singing and dancing until they are paid or given gifts, after which they depart. "Third gender" people are often seen as a sign of good luck at such ceremonies, while the curse of an unappeased transgender person provokes fear. Malik says she opted not to take up dancing as a profession because she did not want to “become a source of entertainment for others." She completed a makeup course and joined a beauty salon in Lahore, allowing her to fund her university degree in journalism. She recently became the first transgender model on the catwalk at the annual Pakistan Fashion Design Council fashion show. The official "third gender" community in Pakistan currently numbers 10,418, according to a recent census, although the community estimates there are at least half a million transgender people in the country. The minority group's recent gains have been groundbreaking in Pakistan, a deeply conservative country where ethnic, religious, and sexual minorities have often been victims of violence and persecution. Yet those gains have done little to hide the difficult lives that third-gender citizens endure. Dozens of transgender people have been killed in recent years. The Trans Action Alliance, a local rights group, says 55 have been killed in Khyber Pakhtunkhwa Province alone in the last three years. On March 28, gunmen shot and killed a transgender woman and her friend in the northwestern city of Peshawar. In 2013, two members of the third-gender community were killed and another abducted and gang-raped by armed men in a predawn attack in northwest Pakistan.